You are still in your mama’s womb, but I’m writing this letter to you so you can know how it was like. What happened in the past few days will probably be remembered by an entire generation. It is probably one of the most significant events in our history since Merdeka Day. But I could be over euphoric at this moment. Some will disagree with me. You see, daddy was there on the 12th General Elections when the people voted for change. I woke up early on polling day because I wanted to vote early while the weather was still cool. The air felt different. I felt different. It’s like I had this mission to accomplish. Even Sushi my hyper-active Shih Tzu (do you remember Sushi?) was a good boy on that day. He ate his food without any fuss and did his business on the newspapers (I have to say that’s all they’re good for… that and wrapping vegetables or killing cockroaches). Daddy drove to the polling station near yeh yeh (grandpa’s) house, parked my car and walked towards the school. I passed by a tent manned by the opposition from PAS and KeAdilan, and they immediately surrounded me. They said “sir, vote for us, vote for us”. One young chap told me in Malay, “You ingat logo ini,” while pointing to their party logos. They invited me to their tent to check my voting registration, but I thanked them and walked on. I passed by the Barisan tent and they were still having breakfast. Inside the polling centre, I met a nice man who found my polling stream for me. I went to the proper queue and waited. Polling stream 4 had the longest line. Everyone was young, and there were people from every race. Everyone looked very serious. Everyone came out of the voting room looking very satisfied. I guess they felt that they have voiced their opinion. The line was moving slowly but steadily, until 20 minutes later when somebody put the ballots into the wrong boxes. They halted the line for another 30 minutes while trying to think about what to do. The ballots had serial numbers. The vote was marked using a pencil. I watched the polling agent to make sure he didn’t write any serial number next to my name on his list, and then I made sure I marked my X really hard and dark on the paper. I put the ballots in the respective boxes in a slam dunk motion, and walked out feeling that I have done something very special. There’s no words to describe the feeling of value, empowerment and freedom when you vote. Later that night, the results that were reported surprised everybody. This event has changed daddy in many ways. For the first time, I saw that there was hope for Malaysia. I saw that I was not alone in my frustration and anger. I saw that race did not matter any more. Last Merdeka day, our church was praying for healing between the races. We were praying for God to cleanse the land from the innocent blood that had been shed on May 13. The walls that have been built up to divide are being torn down. 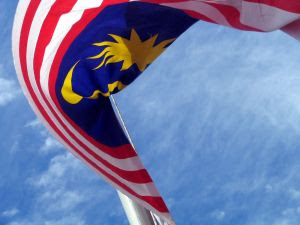 I felt a surge of renewed patriotism for Malaysia. Things are really uncertain as I end this letter. What is going to happen in the next few years? I feel like singing “Heal our Land” after reading this excellent post.